If you’ve ever wanted to see how the teens of Riverdale grappled with the implications of World War II, then boy howdy, does Archie Comics have a new series for you. 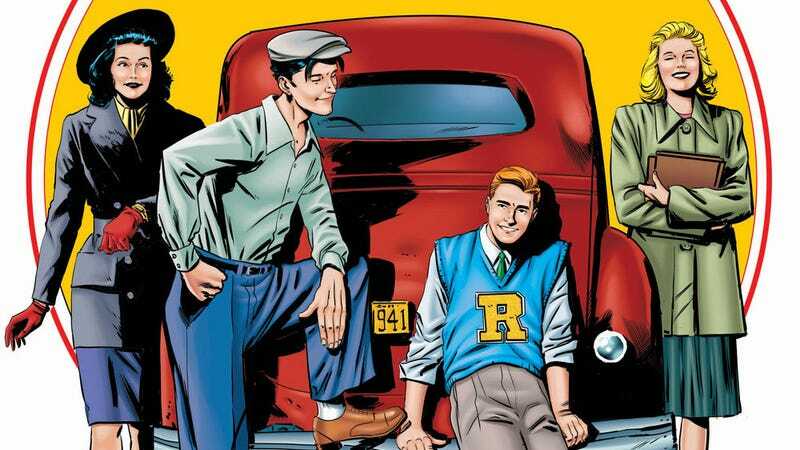 While you may be more familiar with their modern-day Riverdale incarnations, Archie 1941—an upcoming miniseries written by Mark Waid and Brian Augustyn, with illustrations by Peter Krause and Kelly Fitzpatrick—will take the classic Archie characters back to their roots during the early years of WWII. While the series isn’t likely to see any of its main characters actually enlisting, it’ll explore the impact the war has on their lives and how it changes their city. In a press release about the series, Waid explained how placing the characters back in the midst of the war offers a prime opportunity to explore aspects of their lives that readers might not be accustomed to seeing. Archie and the gang attending their high school graduation ceremony. Given that Archie 1941 picks up just as the teens are graduating high school, it’s likely that the comic will focus on how they come to make important decisions about their futures, which would obviously be influenced by the ongoing conflict. Archie 1941 might not exactly be your Riverdale (or your grandparents’ either, for that matter), but it’s sure to add something new and unique to the city’s history. Archie 1941 hits stores on September 12.